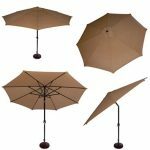 Best Choice Products 10′ Patio Umbrella is an offset umbrella with a sturdy pole and stand. It’s made of quality materials designed to stand against anything Mother Nature can throw at it. You can relax near the pool, pull it out for your next barbecue, or rest comfortably out of the sun in your garden. It’s easy to set up, but it’s also easy to store. Most umbrellas get ruined because they’re left outside when there’s bad weather. A hard-to-close umbrella won’t get the proper storage it needs. Your outdoor umbrella should be giving you shade against the sun. You’ll also want it to offer protection from rain showers. A beautiful day doesn’t have to be ruined with a few rain drops. 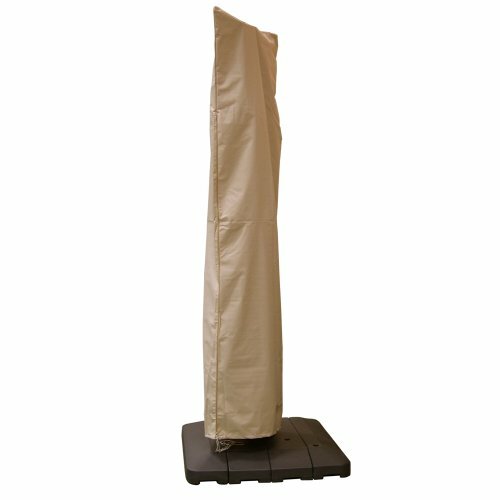 Guests can enjoy the rain while staying completely dry under this waterproof polyester umbrella fabric. Whenever it rains, people run into the house from a party or backyard get-together. With a wide, waterproof umbrella, guests can continue to stay outside while waiting for the rain to let up. The pole of your umbrella will have to be sturdy. It’s the structure that holds the entire umbrella upright. You don’t want one that can’t stand against the elements. It has to be able to hold the umbrella as well as keeping it from falling over onto people. The aluminum in this pole is powder coated to give it extra stability. It’s protected against water, which can lead to rust. Chips and rusted spots will never be an issue with this pole. Along with the powder-coated aluminum pole, this umbrella has a steel bottom. That’s where you’ll find that the umbrella needs more stability. The sturdy design of this umbrella means that you don’t have to worry about the umbrella collapsing or bending. The crank is easy to operate. To open and close the umbrella, all you have to do is crank it to use the umbrella or store it away for the winter. It should only take moments to pull this umbrella out of storage and set it up for your next gathering. At the end, it can be packed away as easily. It’s important to close this whenever there are strong winds from a storm. While the frame is sturdy and the fabric is strong, you stress the structure each time you leave it out during bad weather. The crank makes it simple to protect your umbrella from damage. 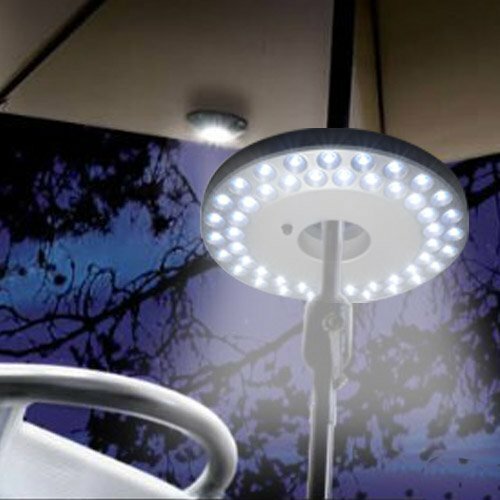 The wide, offset design means that you can use this in a variety of places in your backyard. You won’t be limited by the space where you’ve placed your chairs or tables. When you’re thinking about the configuration of your outdoor furniture, there’s no reason to move things around just for the shade. 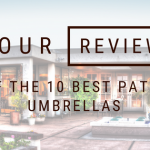 The umbrella is 10 feet, which means that it can be positioned anywhere and provide incredible sun coverage. This umbrella’s offset design means that you can fit this anywhere. One of the biggest problems with umbrellas for blocking the sun is that the sun moves. It takes some time to angle the umbrella correctly as it rises and sets. Most people will leave their traditional umbrella in one spot. They’ll only go outdoors when the umbrella is providing shade. With this umbrella, you’re getting shade throughout the day. It’ll fit near the edge of a pool, near the house, or on a deck. You can angle this as needed, too. You won’t have to move this umbrella constantly as the sun hits you or your guests. 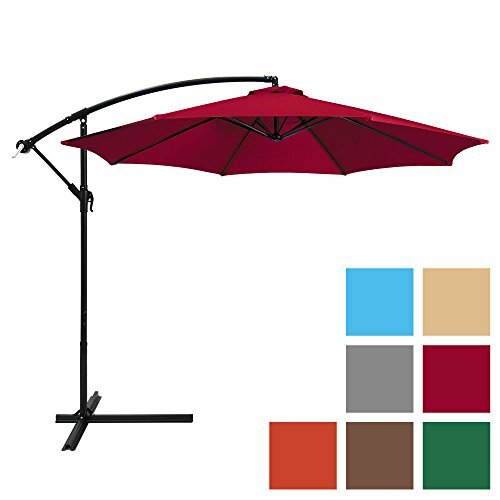 The Best Choice Products 10′ Patio Umbrella comes in 7 colors. There is red, blue, gray, tan, orange, brown, and green. Choose the color that works best with your outdoor furniture or the color of your home. How long is the umbrella when it’s folded? The umbrella is approximately 5 feet when you fold it for storage. You could take it with you in a truck for camping or trips to the beach. Will the pole fit in a standard umbrella stand? There is a T-stand included with the umbrella. You might decide to weigh down the bottom of your umbrella with a stand. 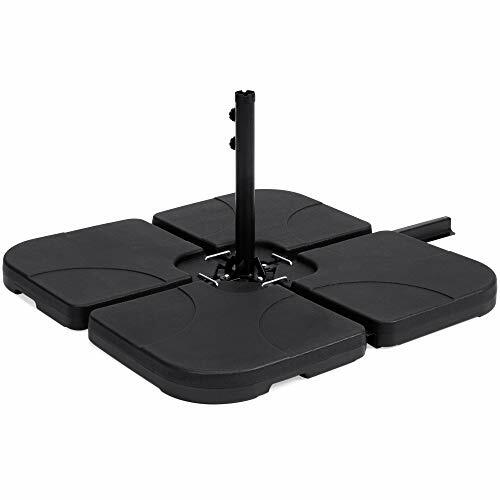 The company provides stands that will fit perfectly. 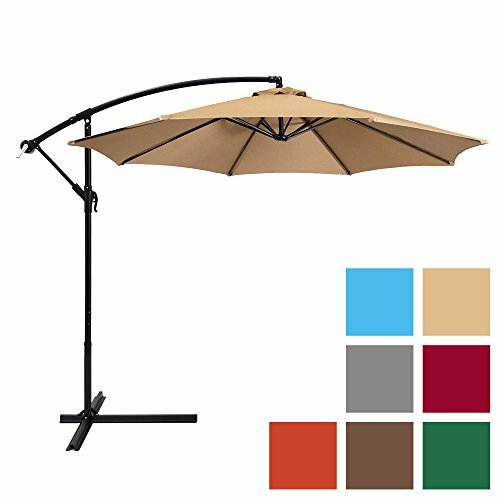 This Best Choice Products 10′ Patio Umbrella is a beautiful addition to any backyard. While we believe it is perfect for your next gathering, you can enjoy this for everyday use, too. There’s nothing like relaxing in the backyard out of the sun with a cool drink on a warm summer’s day. 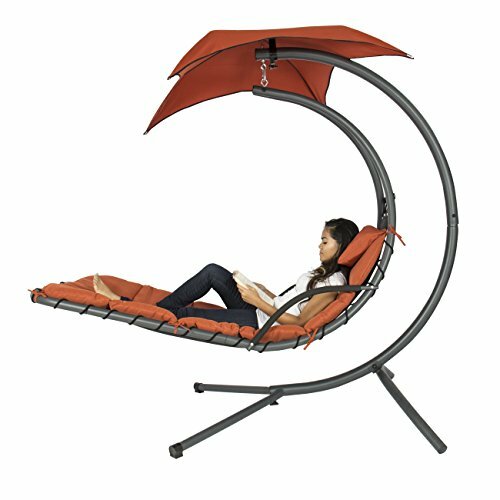 This umbrella will fit in with any of your furniture configurations, too.